In a nearly unprecedented move, the Egyptian government appears to have ordered all Internet service providers to shut off connectivity. As of 1:00 am Cairo time on Friday, January 28 — a day of planned demonstrations — reports began to circulate that Egyptians had lost access to the Internet. Shortly thereafter, it became apparent that only one ISP, Noor Group — which connects about 8% of Egypt’s Internet users — was still available. But every Egyptian provider, every business, bank, Internet cafe, Web site, school, embassy, and government office that relied on the big four Egyptian ISPs for their Internet connectivity is now cut off from the rest of the world. Link Egypt, Vodafone/Raya, Telecom Egypt, Etisalat Misr, and all their customers and partners are, for the moment, off the air. 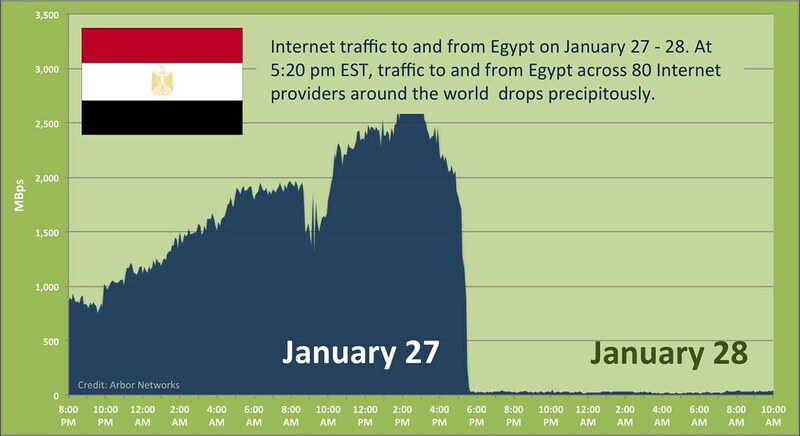 The graphic shows how, at approximately 5:20pm EST on January 27, Internet traffic dropped off almost entirely. Shutting down Internet connectivity in reaction to sensitive political events is an extreme example of just-in-time blocking — a phenomenon in which access to information is denied during important political moments when the content may have the greatest potential impact such as elections, protests, or anniversaries of social unrest. What is happening in Egypt is not without precedent: two other states have implemented national level Internet shutdowns in reaction to political events. In February 2005 Nepal severed all international Internet connections in the country following a declaration of martial law by the King. On September 29, 2007 during the Saffron Revolution the Burmese government completely shut down Internet connectivity in the country in reaction to streams of images and videos documenting the violent government crackdown on the protests uploaded by citizens. Prior to shutting down the Internet, the Burmese government had — not unlike the recent actions by the Egyptian government — increased the number of sites they were blocking, extending the ban to popular social media like YouTube and Blogspot, as well as international news sites. In the case of Burma the apparent objective of the shutdown was to restrict information from flowing out of the country to wider international audiences. What differentiates Egypt from both previous cases is that the government does not have control of the Internet from a central location; rather, ISPs were ordered by the government to shut down service. Complete shutdown of national connectivity is a drastic action, but the “just-in-time” nature of the blocking is consistent with previous OpenNet Initiative findings in countries in the CIS region (e.g. Belarus, Kyrgyzstan, and Tajikistan) where authorities have controlled access to communication technologies as a way to limit social mobilization around key political events. Other countries that have had alleged incidents of just-in-time blocking include Bahrain, Uganda, and Yemen during the run-up to their 2006 presidential and parliamentary elections. In the summer of 2009, the Chinese government shut down Internet access in Xinjiang province following a series of ethnic riots. The OpenNet Initiative continues to monitor just-in-time blocking and other forms of information control around the world.